And other interesting tidbits to keep conversation flowing on Thanksgiving. The Thanksgiving holiday is little more than a day away now, as is the snooze-inducing turkey coma many Americans are going to slip into after (or before, sneaky slackers... ) the plates have been scrubbed. Before arriving at the stuffed state of the holiday, you need to make it through dinner. Here are some fun facts to keep the conversation going amidst all that chewing. 1. There are seven U.S. cities/towns named after many American's favorite Thanksgiving side, cranberries. Towns named Cranberry exist in Maryland, North Carolina, West Virginia and New Jersey, while Pennsylvania is home to three towns paying homage to the red berry. 2. 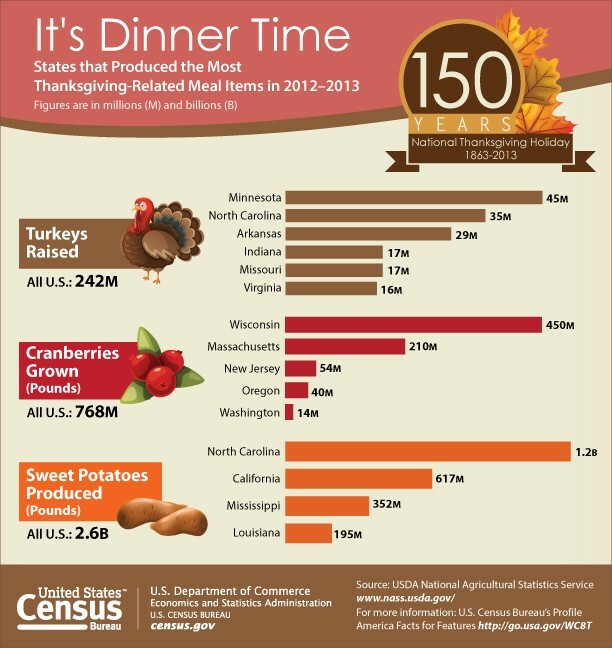 There were 242 million turkeys raised in the United States in 2013. That's a ton of turkey sandwiches, although it's noted that turkey totals are also down by 5 percent from last year. 3. Another popular Turkey Day side dish, 2.6 billion pounds of sweet potatoes were harvested in the U.S. last year and will be making their way into people's bellies during Thursday's dinner. 4. President Abraham Lincoln proclaimed Thanksgiving a national holiday 150 years ago, in 1863, in response to a campaign by magazine editor Sara Joseph Hale. Before that, the only two national holidays were Washington's Birthday and Independence Day. Hale, by-the-way, penned the nursery rhyme "Mary Had a Little Lamb." Thanks, Sara! 6. When Neil Armstrong and Buzz Aldrin sat down to eat their first meal on the moon, their delicious foil packets contained roast turkey with all of the trimmings. On to some fun bits about another holiday tradition, the Macy's Thanksgiving Day Parade, now in its 87th year. 7. Four new balloons are ready to make their parade debut on Thursday — Toothless from the 2010 animated film How to Train Your Dragon, along with Finn and Jake from Cartoon Network's popular animated series Adventure Time. We'll also see a new-and-improved version of Spongebob Squarepants, plus America's beloved beagle, Snoopy gets his seventh balloon update. This year Snoopy ditches his aviator hat and goggles in favor of his bird buddy Woodstock. Keep your fingers crossed that we'll actually get to see these four and the 50 other parade balloons — the threat of forecasted strong winds in the Big Apple could mean they're not able to take flight. 8. Probably the biggest turkey one will see this holiday season: Macy's classic Tom Turkey float, which stands 21 feet tall. 9. For all those Hello Kitty lovers out there, it’s her 39th anniversary this year. 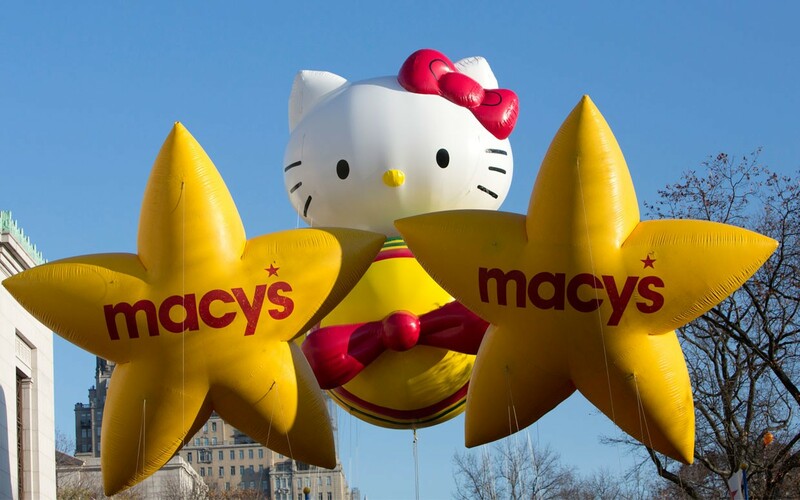 Her balloon incarnation stands 36 feet tall, 38 feet wide and 50 feet long, and the retro airplane design is a throwback to one of the first Hello Kitty looks from the 1970s. 10. More official than any mall visit, the parade's Santa’s Sleigh float marks the official official start of the Christmas season. The final float in the parade showcases Santa’s toyshop as well as a giant ice and granite obelisk supported by ice sculptures of a walrus and a polar bear. 11. Gone are the days in which only women were enlisted help the nation solve its turkey-cooking fiascos. San Diego food blogger RJ Jaramillo is the first ever-male spokesman for Butterball’s Turkey Talk-Line. Making history, folks.